Often when brave men and women are serving in a war zone they find themselves adopting one of the many stray dogs or cats that are struggling to survive there. These soldiers are not only a salvation for the animal; the dog or cat are often described as 'lifelines' to their soldier, providing a respite from war, a moment of peace, home and love. When the soldier's tour of duty comes to an end, it is unthinkable to leave their four legged comrade that they've bonded with, behind. Nowzad proudly boasts the first official animal shelter in Afghanistan. Our well designed and purpose built shelter in Kabul provides a safe home for over 150 dogs. We also have a purpose built cat shelter housing over 40 former street cats rescued by locals or soldiers. Our work has now extended to rehabilitating former working donkeys in a peaceful and caring environment in what is a first for Afghanistan; the Nowzad donkey sanctuary! Nowzad provides a practical training program for the Kabul university veterinary students and para-veterinarian students to increase and promote their interaction with dogs, cats and other animals that they are likely to care for. Our fully ‘hands on’ workshops deliver vital animal handling experience to enrich and enhance the student training as well as providing life-saving rabies prevention techniques. Even without the large scale funding we need Nowzad is determined to prevent the unwanted dog and cat populations to be born on to the harsh streets of Kabul. Where possible we are implementing our humane trap – neuter – vaccinate – return program and thanks to your amazing support we still freely vaccinate all cats and dogs for rabies that visit the Nowzad clinic. For our Afghan vet team this is one of the proudest and most important aspects of their job. Working donkeys and horses are the life blood of the local communities in Afghanistan and Kabul is by no means an exception. Where old meets new in the city; many families have access to motor transportation whilst many more, particularly those who inhabit the surrounding mountains, do not. The working donkey or horse is vital to carry supplies (water, food and building materials) to the outlying villages; including most of Kabul’s surrounding urban areas that are built on the side of the unforgiving mountain terrain. 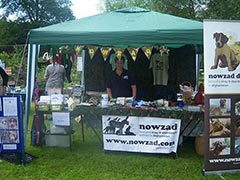 On the 12th September Nowzad founder Pen Farthing will be in Norfolk presenting the 'tale' of the Nowzad charity ably assisted by JebBear, a 3 legged Nowzad rescue.